50th anniversary celebration. Photo by Patty Dee. The event raised more than $6,500 for KCPR in ticket and T-shirt sales — thanks to the generosity of Bruce Flohr (Journalism, '88), who worked with students to stage the concert. Flohr donated the T-shirts and, most importantly, the appearance of Los Angeles pop band Sure Sure, who headlined the event and kept the crowd dancing during their set. Hermosa Beach funk band The Charities and local electro-pop artist .parperman also performed. The celebration continued Saturday, Oct. 13, when more than 200 attendees gathered in the Cal Poly Multi-Activity Center for the Hall of Fame and Through the Decades Gala. During the evening, four new members were inducted into the Journalism Department’s Mustang Media Hall of Fame. 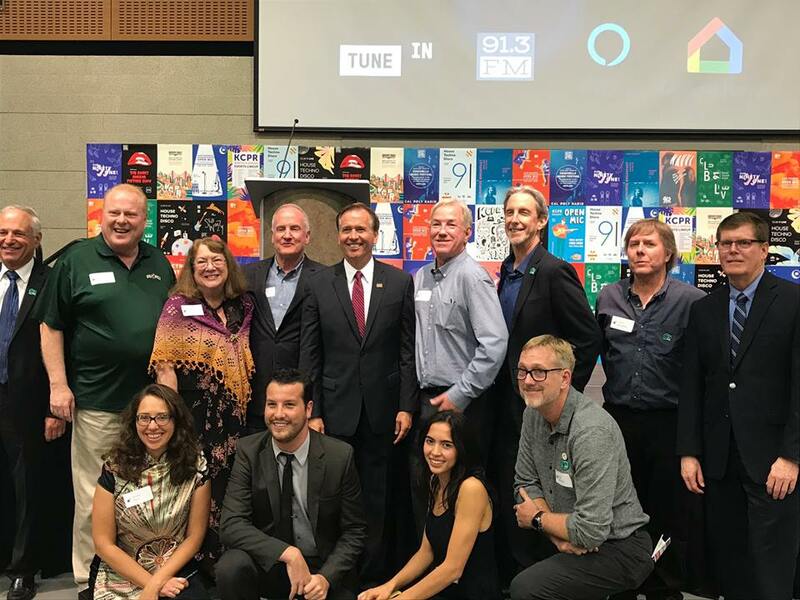 Rick Debruhl (Journalism, '77), ESPN broadcaster and 1977 KCPR general manager, and Steven Pardo (Industrial Technology, '17), Red Light Management digital strategist and 2017 KCPR general manager, hosted the celebration. The two shared their affection for the station with the crowd. “It ended up changing the course of my life,” Pardo said. Another highlight of the evening was a series of entertaining videos, produced by ABC News correspondent David Kerley (Journalism, '79), showcasing the evolution of KCPR. The station has grown significantly since its first broadcast in August 1968. Students from majors across Cal Poly have contributed to that growth and the station’s success. They are on-air and working behind the scenes in critical roles necessary to make the station a vital community resource for entertainment, news, alternative music and culture. Throughout the weekend, dozens of KCPR alumni gathered and recalled their fondest station memories. KCPR’s 1973 general manager Steven Ruegnitz (Journalism, '74) flew in from New York to celebrate. He said he thought the gala gathered the largest assembled group of KCPR general managers in the history of the station.